In this CSS Video Tutorial I’ll show you how to layout a whole web page using Cascading Style Sheets. I’ll create headers, content areas, footers and numerous sidebars. 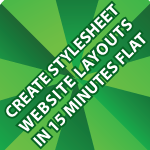 I’ll also show you how to make major changes to a website layout with a limited amount of coding. If you’d prefer to read this information in an article see this CSS Layout and Positioning. All of the code used can be found in the article above and also follows the video tutorial. If you have any questions or comments leave them below. You can use the code in any way that you wish. hey, I’ve just read your tutorial..